18.1.18 We got visitors again! 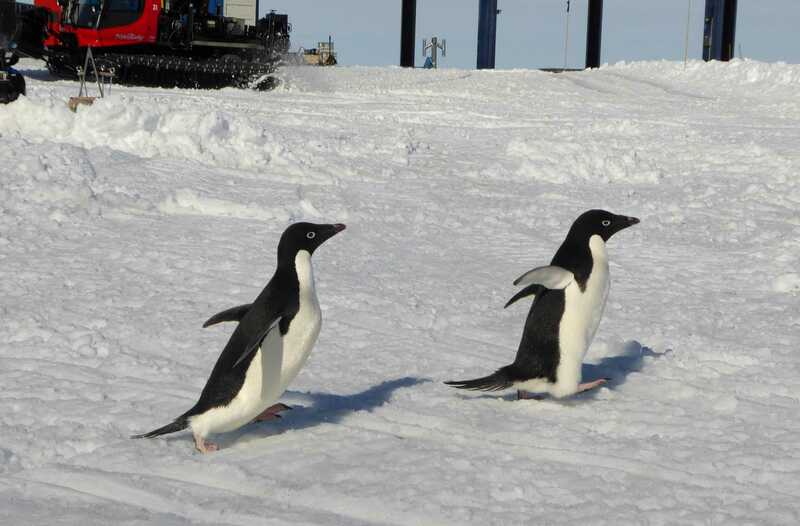 When I came back from my trench on Tuesday, some people were standing around in front of the base with their cameras and I soon saw what attracted them: two little Adélie penguins had come for a visit. 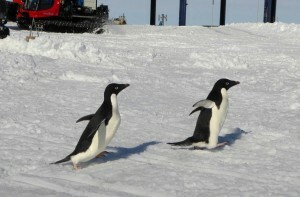 They are smaller than the emperor chicks, but can run very quickly on their short legs (they do not use the belly technique of the emperors so often) and they are very curious and absolutely fearless. 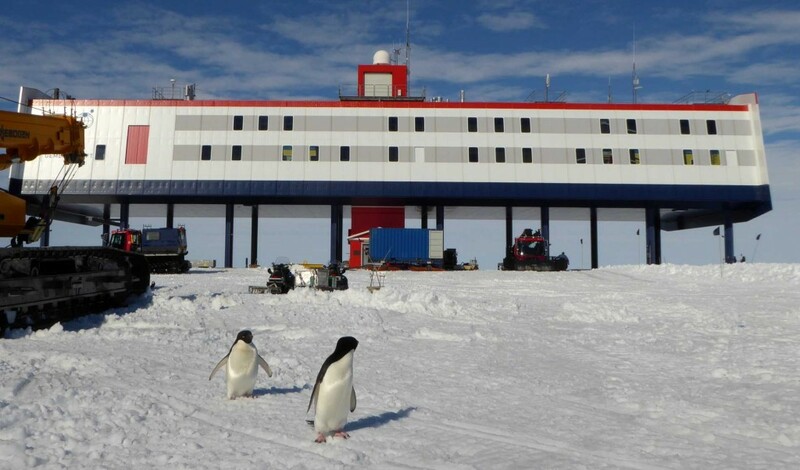 We wondered what made them come the long way from the sea ice to our base, but even the French biologists, who study the emperor penguins in the bay, could not solve this puzzle. Back in 1990, we had a couple of Adélies at the base for several days, and they refused to stay away from the “snowmelt”, the place where we got our water from. They also kept us awake at night with their lively chatting. These two guys seemed to be interested in the what we call “space gardeners” here. 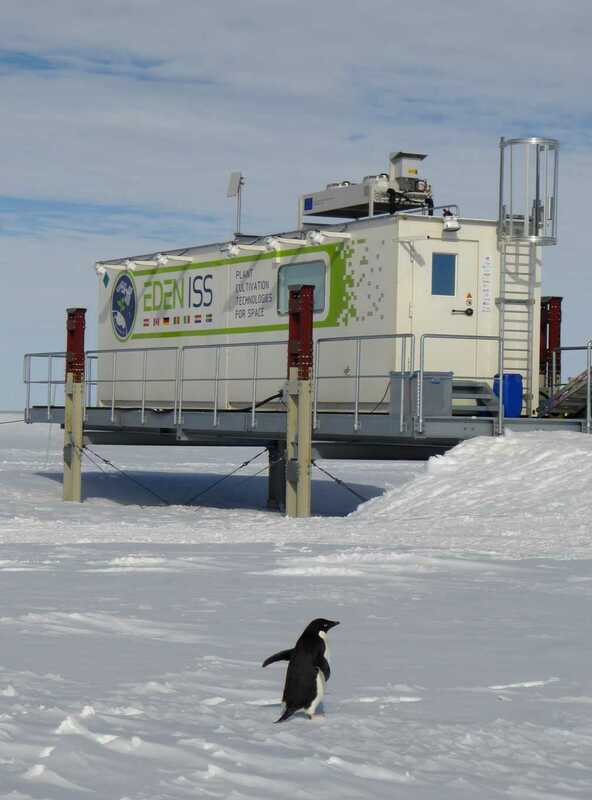 The space gardeners have a container about 400m south of the base, where one of the winterers will carry out an experiment with the flowery name EDEN, where he grows salad, tomatoes etc. without soil (soil is forbidden according to the Antarctic Treaty) as a test for a space mission. It was all over the press in Germany, but I doubt that the penguins could have heard it via those channels. 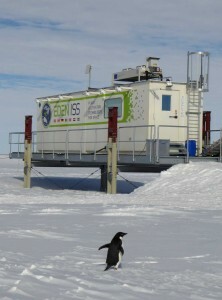 After a little while, they moved on towards the south, maybe they wanted to see the air chemistry lab (or even my trench? ), and we never saw them again. They are cute little fellows, but normally they breed on land, they build their nests out of stones, so nobody knows what they were doing among the emperors or here on the ice shelf. 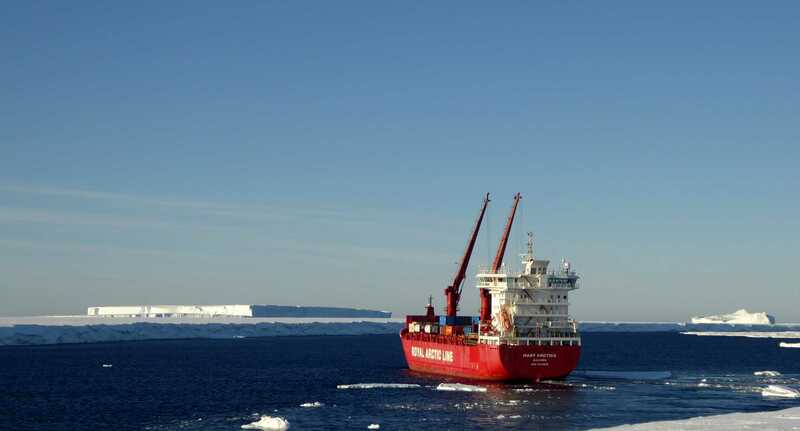 Then we got another ship coming, the “Mary Arctica”, a Danish cargo ship that brought us fuel and took a lot of cargo that had to be brought back to Europe. She was supposed to come already on Monday, but could not get through the pack ice. Finally she made it yesterday in the early morning. The technical crew left with the Pistenbullys and sledges and some curious scientists followed them after dinner to see the ship. When we arrived, they had just finished the unloading, and some of us were a bit disappointed that they had missed it, but I did not care at all: I had longed for seeing the ice edge further to the north, where our old base had been, and I was looking forward to seeing some open water, too. As much as I like snow and ice, the contrast of the deep blue sea and the icebergs, shining in a radiant white, is amazing. The ship had moored at an inlet, one of those V-shaped big cracks at the ice shelf edge, they remind a bit of a fjord in Norway. They develop because the ice is flowing and spreading out, but is too brittle to simply get continuously thinner like a glacier tongue in the Alps. 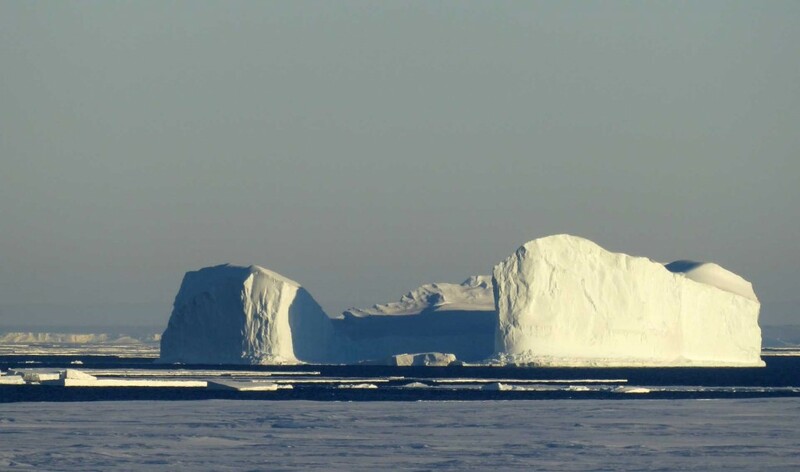 There are many inlets at the edge of Ekström Ice Shelf, on which Neumayer was built. Often there are crevasses in the vicinity of the inlets, too, so we had to be careful. We came just in time for the departure of the “Mary Arctica”, and even though it was just a container ship, not a pretty research icebreaker like “Polarstern” (which we expect for the 29th of January), it was a stunning sight: the red ship in the middle of the broken sea ice floes with the deep blue water in between, the fantastic shapes of the white icebergs in the background . The ship’s horn tooted once and they slowly left the natural ice pier. We did not get a chance to talk to the crew, but somebody on the bridge waved at us and we waved back. 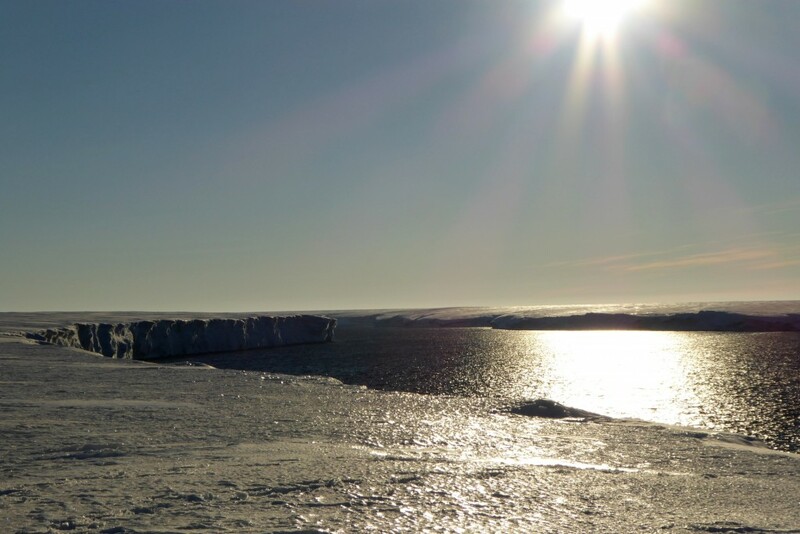 After a while they stopped the engine again, we did not know their plans, so we started our skidoos and went back to the base, the icebergs and the blue water to our left, the station 20km away at the horizon in the southwest. I thought about an evening back in 1991 when we had gone to the ice shelf edge close to the so-called Aklestad Inlet. There was almost no wind and, in the inlet, the water was absolutely calm so that the steep ice cliffs of the inlet were mirrored in the water. Incredibly beautiful. I hope to see something like that again before I leave!